Orange County Mayor Teresa Jacobs joined federal, state and local officials at the Orlando Veterans Administration (VA) Medical Center Dedication Ceremony in Lake Nona and marked the milestone achievement with a celebratory ribbon cutting ceremony on May 26. 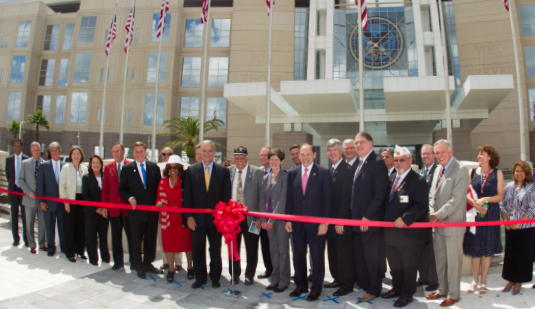 Secretary of Veterans Affairs Robert McDonald recognized the steadfast efforts of the Central Florida community whose dedication contributed to opening of the nation’s newest VA Medical Center. The new VA Medical Center is located in Lake Nona’s Medical City, a 650-acre, health and life-science park in east Orange County. The region’s Medical City is home to some of the nation’s top hospitals, universities, research institutions and health and life-science companies including the University of Central Florida Health Sciences Campus, the Sanford-Burnham Medical Research Institute, Nemours Children’s Hospital, and the University of Florida Academic & Research Center. The VA Medical Center also will house the Veterans Health Administration (VHA) Simulation Learning, Education and Research Network (SimLEARN) National Simulation Center. The 52,000-square-foot center will serve as a high-tech advanced training facility for VA medical centers across the nation. Orange County has a deep connection to the military through the region’s active duty and retired service men and women, and robust modeling, simulation and training (MS&T) cluster. The region is home to 150 industry-related companies and the acquisition commands for the Army, Navy and Marine Corps; the Air Force Agency for Modeling and Simulation; plus 10 other federal government agencies and joint commands. The Central Florida Research Park, located next to the University of Central Florida, is the epicenter of the MS&T industry, which contributes more than $4.8 billion to Florida’s gross state product and directly employs more than 27,000 Floridians, with an average salary of almost $70,000 annually. A collection of photos from the Orlando VA Medical Center dedication are available on Flickr for use by the media.